Adorable, right? 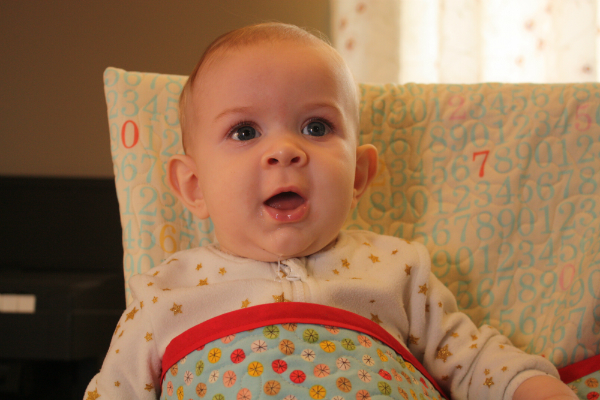 Every quilting blog should have a dose of baby cuteness now and then! Judah belongs to our friends Greg and Crystal, and he's 5 months old (I think). A few weeks ago Crystal said something along the lines of, "I have a pattern for something and I was wondering if you could make it for me." Now, I can confidently acknowledge that my quilting skills are pretty good, but my sewing-anything-else skills can be a little questionable. For example, if the finished item has to fit a person properly, I'm not making it for anyone other than myself just yet! Once I had a look at the pattern, though, I agreed to give it a go because it seemed both pretty simple and more than a little genius. And, having now finished the project, I can say I was right on both counts. Unfortunately, I forgot to take pictures of it not in use, so we'll have to go with my description of what isn't clear in the picture. 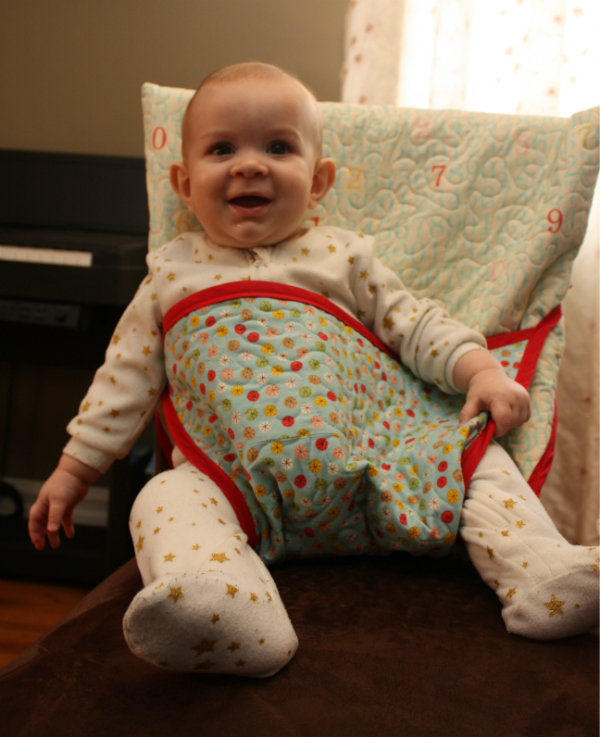 This is a portable baby seat that folds up really small, but holds the baby securely in any dining room style chair. Isn't that brilliant?? I mean, how many times do parents go out to visit friends or family and they want to have baby with them, but not actually in their arms? You can't lug a high chair with you everywhere you go, but this little thing could easily fit in a diaper bag (or suitcase, if needed), then you just pop it over the back of the chair and suddenly your arms are free! How I wish I had had one of these when our boys were small! How does it work, you ask? Well, there's an opening in the back part that slides down over the back of the chair, and then the front part comes up between baby's legs. What you can't see in the picture is that the red bias tape that goes around the edges extends past the fabric to become long ties. Those ties get threaded through loops on the sides of the back piece. Pull the ties as tight as needed to hold baby in place, then tie a knot at the back of the chair. As you can see, Judah was quite content to test it out for us! I used this pattern** from Canadian Living, which instructs you to buy pre-quilted fabric. That wasn't available, so Crystal picked out these two cute prints and I just quilted it myself with a quick stipple. I had a serious moment of confusion over the width of the fabric needed, though, since the pattern said it required 1.2 m of 115 cm-wide fabric. Now, the 1.2 meter part I had no problem with because all the fabric stores in Canada sell fabric by the meter, so whenever I go to the store I buy in meters. The 115 cm threw me off, though, because my brain automatically went to extra-wide quilt backing, which is typically 108" wide. It wasn't until Crystal and I had our second or third text exchange about what to buy, and I checked the pattern again (for the third time), that I realized she didn't need to buy extra-wide fabric. Regular quilting fabric, the 45" stuff I've been buying for years and years, is 115 cm! I don't think I've ever seen the width of the fabric measured in metric before. Crystal told me afterwards that every time she said something about the fabric being 115 cm to the lady at the fabric store, the lady would respond with, "yeah, 45 inches." I guess I'm not the only Canadian who thinks of the fabric width in inches! This little seat would make a great gift for new parents and I'm thinking I'll be making many more of them in the future, especially now that I know what size fabric to buy! ** Edited September 1, 2016...Aack, it seems the pattern has disappeared from the Canadian Living website! I'm so sorry that link is no longer valid. ***Edited April 10, 2017...okay, here's a new link that is working (for now!). This is genius! I need to make one for my grandson. Thanks for sharing! Judah is adorable and the baby seat looks great! Awesome project! I'm sure it's very helpful to parents. And yes, Judah is adorable. Wow! This is a really great idea. And you did a fantastic job, Leanne. Judah certainly looks comfy and happy! Awesome! It is very clever. And what an adorable tester/model. What a cool and useful pattern. Wow - if that's not cute! Look at that happy baby in a safe seat. Great job. I had something similar to this when my kid's were young...but this one is a bit simpler. Might have to make one for my grandson when he is a bit older. A very practical and lovely finish this week! I thought about making something like this for DT, but we ended up buying Lobster chairs. They clamp right on to whatever table. Thanks for linking up with TGIFF @ A Quarter Inch from the Edge! Great. Love it. I wanted to make all the things for my grands. I loved the shopping cart covers. Thanks for sharing this. Love it. Pardon my stupidity, but what are the dimensions of the actual pattern? Not stupid at all, Candy! The pattern is approximately 21" wide and 45" long. I'm replying here because you are a no-reply blogger, so I hope you check back!